My relationship with high-rye ryes is mixed. 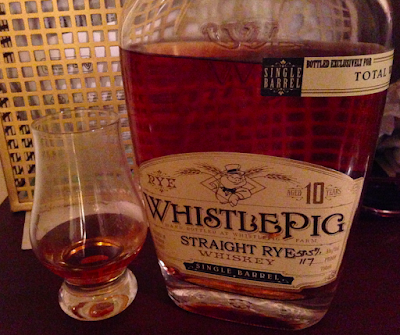 The MGPI/LDI ryes (95% rye) usually tasted like dill pickle juice to me. But the first batches of Jefferson's Rye, Masterson's Rye, and Whistlepig Rye (all made from 100% ryes distilled at Alberta Distillers) were really good, B+ stuff. Then Jefferson's Rye disappeared, and the last few bottles of Whistlepig and Masterson's that I bought were mediocre or worse. So with some trepidation, I bought this Total Wine single cask on sale ($60). And that meant me standing around in the store for 10 minutes, contemplating the decision as if I were about to use the nuclear codes. Such a drama queen. Good news. This is a return to the best batches of yore, and then some. Yes, it's got some of those mint/rosemary/dill notes, but it's not pure pickle juice. Instead, it's got enough cinnamon and oak to balance it out, with a nice honeyed sweetness on the front end. For $60, this is a hell of a bargain. If you enjoy rye at all, you'll love this. 87 points/B+. After the first bottle, I bought 4 more the same week, if that's any indication of my sincerity.